According to the World Health Organization, 800 women die every day from preventable causes related to pregnancy and child birth. One of those causes is inadequate lighting. This is the 21st century. How is this happening? And what can be done to stop it? Nigeria is one of the 10 most dangerous countries in the world for a woman to give birth. In 2010, an estimated 40,000 Nigerian women died in childbirth — 14% of all such deaths worldwide, according to the World Health Organization and the United Nations. Meanwhile, the neonatal mortality rate is also one of the worst in the world. Each year, about 4% of babies in Nigeria die before reaching 28 days old; for comparison, the United States rate is only a fraction of this at 0.4%. As a sort of kismet, Dr. Satchel's husband, Hal Aronson, is a solar energy educator, who was able to help her work on a solution. Part of what he came up with a portable solar panel kit they call a "solar suitcase." 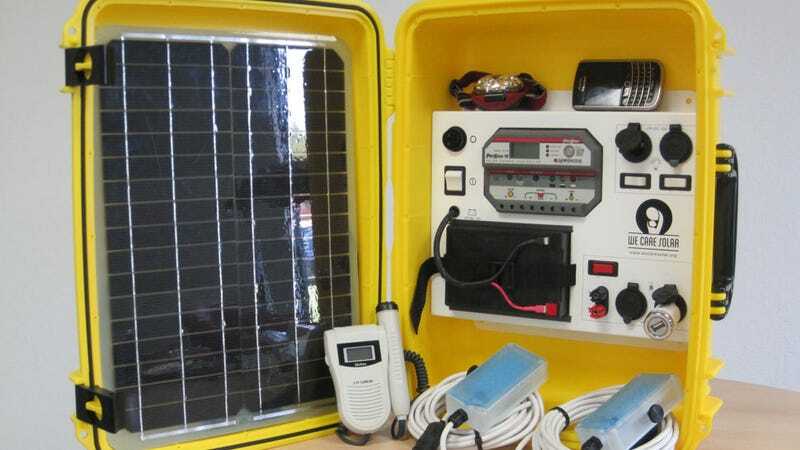 [T]he solar suitcase includes two solar panels that are mounted on a clinic's roof and connected to high-quality LED lights. Once fully charged, it can provide light for up to 20 hours. The kit also contains headlamps, a fetal Doppler to monitor a baby's heart rate and a cell phone charging unit. Dr. Stachel and her husband formed the non-profit organization We Care Solar, and their story was told as part of CNN's Heroes nominations for 2013. We Care Solar provides the solar suitcases—along with training and installation—to hospitals and clinics free of charge, their kits have been distributed throughout Africa, Asia, and Central America. One year after receiving the solar panels designed by her husband, the hospital that Dr. Statchel had fist visited in Nigeria reported that the death rate for women in childbirth had decreased by 70%. Still, 99% of all maternal deaths occur in developing countries, and are due, according to WHO, to low-resources.